De achttiende-eeuwse Hagenaren konden er alle dagen van genieten, van de kleurige aanblik van de Cent Suisses, de Zwitsers die deel uitmaakten van de ‘Huys trouppes’ van de stadhouder. Met acht tegelijk hielden zij 24 uur de wacht in het stadhouderlijk kwartier, samen met acht leden van de Hollandse Gardes du Corps, twee hellebaardiers, een sous-brigadier en een korporaal. Bracht de stadhouderlijke familie een bezoek aan de comedie dan stonden er twee Cent Suisses geposteerd bij de ingang van de vorstelijke loge. De ‘Cent Suisses’ was een instelling die behoorde tot de hofhouding van Willem IV en vooral bedoeld was als ceremoniële omlijsting van de nieuw verworven waardigheid van erfelijk stadhouder. Slechts de helft was in actieve dienst, de andere helft bestond uit gepensioneerden die alleen bij plechtige gelegenheden of parades werd opgetrommeld. Door hun kostuums waren zij duidelijk te onderscheiden van het eveneens in Den Haag gestationeerde regiment Zwitserse gardes, dat onder het staatse leger viel. Dit regiment ging gekleed in blauwe jassen met witte belegsels, rode kragen en omslagen. De Cent Suisses zagen er nog feestelijker uit, in het quasi zestiende-eeuwse, opgepofte kostuum, dat de uitdrukking wilde zijn van de eeuwenoude standvastigheid en trouw aan vorst en oude zeden. De stof was in de lengterichting doorgesneden en ingezet met stroken van verschillende kleuren – ‘orange blanche bleu, der Ouden Vorstelijke Staatsche vlag en veldteken’, zoals Johannes Le Francq van Berkheij schrijft. 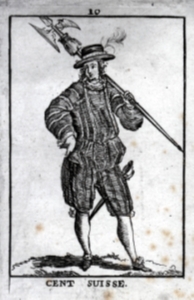 De bewerkte stof, en ook de bonnet met pluim, gepofte broek en rozetten op de schoenen deden hem overigens sterker denken aan de oude Hollandse dracht dan aan die van de Zwitsers. Wat hem betreft hadden de Cent Suisses net zo goed de naam Cent Hollandais of Cent Bataves kunnen voeren. Klinkt hier iets door van Rousseaus kritiek op de vreemde krijgsdienst? ‘Un citoyen se doit à sa patrie’, schreef de Geneefse filosoof en die overtuiging zou langzaam maar zeker algemeen worden. Voor de Cent Suisses kwam het einde in 1795; de Zwitsers in krijgsdienst daarentegen beleefden van 1814 tot 1829 nog de restauratie. H. Amersfoort, Koning en kanton. De Nederlandse staat en het einde van de Zwitserse krijgsdienst hier te lande 1814-1829, Amersfoort 1988 J. Le Francq van Berkheij, Natuurlijke historie van Holland, dl. III (1776) 504. F. G. J. Ten Raa, ‘Het garnizoen van ’s-Gravenhage in de laatste helft der vorige eeuw’, Jaarboek Die Haghe (1900) 28-47. This article discusses the work of the famous engraver Bernard Picart (1673-1733), who figured prominently in my The Radical Enlightenment. Pantheists, Freemasons and Republicans (1981), along with his friends Prosper Marchand and Charles Levier. More precisely, it is devoted to his magnum opus, Cérémonies et coutumes religieuses de tous les peuples de monde (1723), which he published in collaboration with Jean-François Bernard. 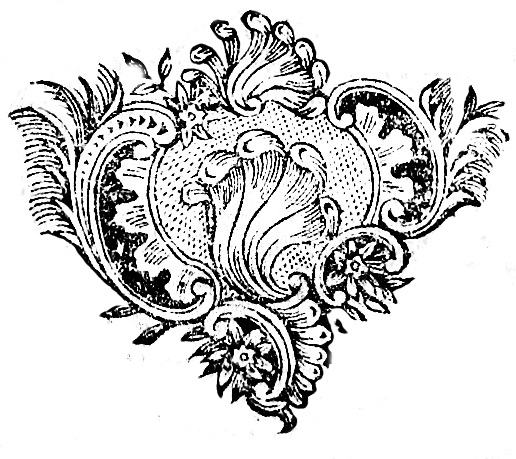 This article stresses Picart’s French background, in an attempt to account for why it might have been that in November of 1710, so early in his exile in the Dutch Republic, Picart turned up in the company of men he called his ‘frères,’ a small ‘secret’ society of publishers and book sellers. This is article contains an outline about why and how Picart became a devotee of the new science, a Protestant and a comparativist critic of religious mores, breaking away from his French, catholic background. The work of the ‘Belgian’ historian marquis François Gabriel Joseph du Chasteler (1744-1789) is not of the same quality as, for instance, historical writing in France or the Northern Netherlands. Nevertheless, when viewed within the broader historical culture of the Austrian Netherlands, the work of Du Chasteler turns out to be of considerable interest because it exemplified a major transformation in the practice of history in the eighteenth-century Southern Netherlands. Du Chasteler’s historical career took off with genealogy and local history. Before he became a member of the Imperial and Royal Academy of Sciences and Belles-Lettres of Brussels, his research was mainly the intellectual pastime of a nobleman with historical interest. When in 1779 he joined this scientific company, his work underwent an important shift in terms of subject matter and quality. Together with his colleagues from the Classe d’histoire of the Brussels Academy Du Chasteler used his historical talent to introduce the national perspective as guiding principle into eighteenth-century historiography. This national perspective replaced the local and regional tradition that had prevailed until then and was accompanied by an enlightened plea for the incorporation of the history of civilisation into the study of the national past. The most important achievements of the marquis du Chasteler for the Academy and its historiographical project were the 1779 plan to write a national history of the Austrian Netherlands and his chairmanship of a Comité historique for the edition of the national sources. Both initiatives gained much enthusiasm but much less result. Still, they were of major importance for putting the writing of national history and the edition of the national sources high on the agenda of Belgian historiography during almost the entire nineteenth century. Little is known about the way eighteenth-century authors and publishers agreed upon contracts or made other business deals. In most cases authors were ‘paid’ in copies of their own work, but their copyright was not protected. Especially poets were supposed to write for fame and glory and not for money. This arrangement seemed fair in case a work didn’t sell, but what to do as an author when a work turned into a best-seller? Publishers on the other hand were not protected either. The only thing they could do was to obtain privileges for works they had invested money in, in order to prevent reprinting. One of the most important Dutch publishers of original and translated literature in the second half of the century was Pieter Meijer (1718-1781), working in Amsterdam, a poet himself and famous for the circle of well-known poets around him. He entered history with a spotless reputation. A document written by one of his best-selling authors, Nicolaas Simon van Winter (1718-1795), reveals nevertheless that Meijer treated him and his even more famous wife, the poet Lucretia Wilhelmina van Merken (1721-1789), badly. The writers handed over their works to him without signing any contract, since their business relation was based upon friendship. This friendship, however, didn’t prevent Meijer from giving the poets only very few copies of their works, concealing the print numbers and buying privileges on their works in secret. The friendship ended after twenty-five years when Meijer ‘corrected’ some poems of Van Merken without even showing or telling her. This article claims that these corrections were not made to improve the poems, but to secure Meijer’s position as editor of the work. By 1775 it must already have been clear that publishers were likely to lose their copyright on works unless they were themselves the authors or editors. In this contribution an outline is given of recent research into the Enlightenment period in general and the Dutch Enlightenment in particular. It is argued that in all recent studies ‘Enlightenment’ is considered to be a uniform European phenomenon. This assumption conflicts with the view, popular since the 1980s, of a plurality of Enlightenments. What is more, in these five studies the traditional approach (advocated by Cassirer) to the history of ideas as a self-contained discipline is abandoned in favour of Peter Gay’s conception of a social history of enlightened ideas. Both Israel and Wielema focus on the early Enlightenment, while the last three books deal with the later part of the period (1750-1815). A general conclusion to be drawn is that in the second half of the period the preoccupations of Enlightenment culture changed to a certain extent. Wielema’s account suggests that after 1740 interest in Spinoza among Reformed believers gradually faded away, while Van Eijnatten contends that the changes in the importance attributed to religion were themselves due to enlightened ideas. Religion became an important means to develop the moral self of the individual, to advance his level of civilisation or enlightenment. According to Kloek and Mijnhardt the nation as imagined community of all polite citizens originated in Enlightenment sociability, which in the Netherlands came into existence around 1750. Sas deals with the politicisation of Dutch Enlightenment culture after 1780, which requires the identification of a specific Sattelzeit between the Enlightenment / Ancien Régime and modern society. Notwithstanding these different perspectives, the crucial significance of the Enlightenment period for the cultural history of the West is still something that most researchers agree on. This essay consists of three parts. The first opens the debate on the notion of the universality of the so-called Atlantic Republican tradition. It asks the question if the grand republican narrative produced by British and especially American historians should not be considered as the legacy of the traditional writing of national histories. It’s capacity to serve as a universal principle for historical development seems to derive as much as from its brilliance as from the dominant position of England and the USA in world politics and the world economy. The second part offers Franco Venturi’s European perspective on republicanism as developed in his Utopia and Reform of 1970 as an alternative for republican studies on both parts of the Atlantic. In the last part, the international trajectories of the Dutch republican models of the early modern period are analyzed as an example of this alternative approach. Despite many parallels between the Swiss and the Dutch republics, there are numerous differences that indicate two very different understandings of the idea ‘republic’. In this article these differences are demonstrated. Two pertinent examples of differences between the Netherlands and Switzerland have been presented, namely Pieter Valkenier and Etienne Bonnot de Mably. The differences between these cases are analyzed in the context of republican theory discourse, with a discussion of the differing political visions of the Patriot movements. As a conclusion, the publicly relevant educational concepts have been presented. Three educational ideologies are distinguished: the ideology of ‘doux commerce’, the idea of public discourse of enlightened and rational citizens, and the elitist, ‘antiquizing’ virtue ideology. All three failed to keep up with modernity, which, in form of modern democracies, nonetheless depend on the existence of some kind of public or civic virtues. De legendarische dichter-zanger Orpheus in herders gewaad, zijn staf met hoed in het gras gestoken, vogels fladderend om zijn hoofd, een leeuw aan zijn voeten, geheel mak door de betovering van het lierspel en stemgeluid. Dit toepasselijk embleem, geschilderd door de verder onbekende kunstenaar P. van de Wal, siert een van de twee wapenboeken uit de jaren 1663-1793 waarmee de leden van het Arnhemse muziekcollege zich hebben laten vereeuwigen. Si Vox est Canta, sinds 1778 Santa Caecilia geheten, bestond al sinds 1591 en behoort daarmee tot de oudste muziekgenootschappen van Europa. De wapens zelf getuigen vooral van de voornaamheid van de leden. Slechts een enkeling als de heer H. Tulleken liet zich verleiden tot een wapenspreuk over muziek: Ubicunque harmonia, ordo et proportio sunt, ibi symphonia est – overal waar harmonie, orde en evenredigheid aanwezig zijn, daar is symphonie. Het zou mooi zijn geweest als het muziekcollege even zorgvuldig zijn muzikale oefensessies en openbare concerten in beeld had laten brengen. Gelukkig geven de archiefstukken allerlei tot de verbeelding sprekende details. Zoals de partijen oesters die jaarlijks vanuit Amsterdam naar Arnhem werden verscheept voor het souper op het Sint Caecilia-feest. Een aantekening uit 1776 vermeldt dat er 2000 stuks werden besteld, niet gering voor een ledental dat steeds fluctueerde rond de twintig. Nu mocht men wel vrienden meenemen naar dit feest, en misschien werd er ook gerekend op het stadsbestuur dat de jaarrekening voor verwarming en licht betaalde, en het bestuur van het Sint Catharina-gasthuis dat de ruimte ter beschikking stelde, maar dan nog. Belangrijker zijn hier natuurlijk de gegevens over de muzikale smaak en praktijk. 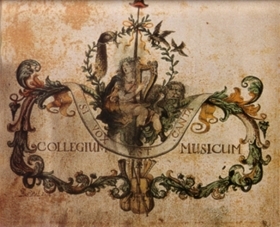 Bijvoorbeeld dat het college in 1785 de muziekstukken van Geminiani, Locatelli, Vivaldi en tijdgenoten als ‘verouderd’ uit de eigen muziekbibliotheek verwijderde om ruimte te maken voor de eigentijdse muziek van Boccherini, Haydn, Pleyel en minder bekende componisten. En over de veelal buitenlandse, professionele musici die werden aangetrokken voor de openbare concerten. Opvallend veel zangeressen met Italiaanse namen en musici uit de bij Arnhem ingekwartierde Duitse regimenten. Een diepe inzinking omstreeks 1795 – een dramatisch laag ledenaantal, Franse militairen die de bibliotheek leegroofden en het klavier in stukken sloegen, de concertruimte bezet door zieke militairen – kwam het muziekcollege wonderbaarlijk snel te boven. Dat het ledenaantal in 1805 al naar 33, in 1810 zelfs naar 94 was gestegen zal zeker te maken hebben gehad met moderniserende maatregelen. De dure feesten werden afgeschaft zodat er meer geld besteed kon worden aan muziek en er werden ‘damesconcerten’ ingevoerd. J. W. Staats Evers, Het St. Caecilia-concert te Arnhem, opgerigt in 1591, uit het archief beschreven, Arnhem 1874. This article studies the life of Colingris, a French shoemaker, deserter, and gang leader, who smuggled tobacco and wool between France and the Southern Netherlands in the 1750s. He pretended to be invulnerable, and claimed to be able to make his men as invulnerable as himself by magical rituals. This article tries to reconstruct his life, and argues that, considered in their own historical, regional and economic context, his acts were not that strange or irrational. His rhetoric and behaviour consisted of complex cultural appropriations loosely based on a popular magical book, and on several magical and religious practices. They were part of a strategy of intimidation, intended to reduce the risks of smuggling. However, as his actions took place in a key-period in which a regional and transnational logic gradually lost ground to the ‘national’ aims of the centralizing state, Colingris’s life ended on the gallows in 1759. The eighteenth-century musical revival in the Austrian Netherlands largely coincided with the governorship of Charles of Lorraine (1741-1780). On the musical landscape had the governor- general and his court a decisive impact. As the princely representative of the monarch, Charles had the enjoyment of a proper court chapel. The Grand Théâtre, though privately owned and managed, stood in a close relation to the court and was the integral part of a representational culture. At the same time, however, Charles found himself in a position of political marginalisation. Therefore music meant in the first place distraction and amusement for him and the same applied to a number of aristocrats belonging to his intimate circle. Although music primarily stayed a matter of the court and aristocracy, the question arises whether the period nevertheless reveals signs of an emerging bourgeois culture in which music acquired a more public and commercial status. At first sight this evolution is evidenced by the sheer name of the most active Brussels concert society, which was called the Concert Bourgeois. Yet it appears that the Concert Bourgeois as well had a privileged relation with the governor-general. Besides, the concerts were both frequented and supported by prominent aristocrats. Because of its close affiliation with the courtly-aristocratic establishment the Concert Bourgeois could have no direct commercial aspirations. Altogether, commercial dynamics can hardly be discerned in the Brussels music life of those days. Scores and musical instruments remained expensive and became only in the nineteenth century affordable for broader segments of the urban population. It was rather on the mental than on the material level that things were changing. While music in the past had mainly served representational and religious goals, it could now be approached and appreciated as a ‘commodity’ for the satisfaction of an individual (aesthetic) need. In this universe of commodities it was Paris that set the tone. The occupation of Brussels by the troops of Louis XV in 1746-1749 gave a strong impetus to the frenchification of the town. In that process the Grand Théâtre, where the famous French playwright Charles-Simon Favart had introduced the new genre of the opéra-comique, made a substantial contribution. The musical revival under Charles of Lorraine must be considered an Indian summer in which the old privileged groups were the protagonists. It does therefore not fit well into a linear, teleological and bourgeois-oriented scheme of history. In the eighteenth-century opéra-comique Mimi in ’t hof [Mimi at Court] (a 1756 translation of Charles Simon Favart’s Ninette à la cour from 1755), the theatricality of court and society is severely criticised and expressed in what could be called ‘a yearning for naturalness’. This yearning manifests itself in almost every discourse from the mid-eighteenth century: from science to politics, economy, law or the arts, the concepts of ‘nature’ and ‘naturalness’ are omnipresent. Within the abyss of possible meanings and uses of the terms, ‘nature’ and ‘naturalness’ find their most urgent expressions in the passionate desire to reform a society that to its inhabitants seems to be in confusion and decline. As a contemporary cultural critique, the yearning for naturalness re-actualizes the old topos of Arcadia by promoting the original ‘natural’ state of man as a desirable model for future societies. By confronting the ideology of Mimi in ‘t hof with some texts by Jean-Jacques Rousseau (the Discours sur l’origine et les fondemens de l’inégalité parmi les homes [Treatise on the origin and the foundations of the inequality among men], 1754 and the Essai sur l’origine des langues [Essay on the origin of languages], ca 1760), the contribution demonstrates that this future model of society is based on a paradox in which neither history nor future can exist. La vie musicale des Pays-Bas autrichiens et de la principauté de Liège intéresse les musicologues depuis le dix-neuvième siècle. Après l’évocation des travaux les plus importants et des outils bibliographiques, les institutions et les compositeurs les plus importants font l’objet d’un bref commentaire qui vise à suggérer de nouvelles pistes d’investigation, qu’il serait profitable d’explorer dans une approche pluridisciplinaire réunissant les musicologues, les musiciens et les historiens. Although musical life in the eighteenth-century Dutch Republic cannot, perhaps, be compared to that of Italy, France, England, or the German-speaking countries, it was nevertheless lively and multi-faceted, largely concentrated in the cities. Its origins can be traced back to the early years of the Dutch Republic, the first half of the seventeenth century, when the cities employed organists, carillon players, town waits, and trumpeters. The eighteenth century saw the rise of a public musical life, with its main focus on the concert hall and the opera theatre. In addition, free lance musicians played an important part. This contribution briefly discusses these aspects of Dutch musical life in the eighteenth century. Wyger Velema, ‘Wijnand W. Mijnhardt on the Historiography of Republicanism. A Reply’. Wijnand Mijnhardt, ‘A Reply to Wyger Velema’.